Diana was the first created before all creation, in her were all things, out of herself, the first darkness, she divided herself into darkness and light, she was divided. Dianus, her brother and son, herself and her other half, was the light. And when Diana saw that the light was so beautiful, the light which was her other half, her brother Dianus, she yearned for it with exceeding great desire. Wishing to receive the light again into her darkness, to swallow it up in rapture, in delight, she trembled with desire. This desire was the dawn. But, Dianus, the light, fled from her, and would not yield to her wishes; He was the light, which flies into the most distant parts of heaven, the mouse which flies before the cat. Then Diana went to the Fathers of the Beginning, to the Mothers, the Spirits who were before the first spirit, and lamented unto them that she could not prevail with Dianus. And they praised her for her courage; they told her that to rise she must fall; to become the chief of goddesses she must become a mortal. And in the Ages, in the course of Time, when the World was made, Diana went on Earth, as did Dianus, who had descended, and Diana taught Magick and sorcery, whence came witches and Magickians, and all that is like man, yet not mortal. And it came thus that Diana took the form of a cat. Her brother had a cat, whom he loved beyond all creatures, and it slept every night on his bed, a cat beautiful beyond all other creatures, a fairy; he did not know this. Diana prevailed with the cat to change forms with her; so she lay with her brother, and in the darkness assumed her own form, and so by Dianus became the mother of Aradia. But when in the morning he found that he lay by his sister, and that light had been conquered by darkness, Dianus was extremely angry; but Diana sang to him a spell, a song of power, and he was silent, the song of the night which soothes to sleep; he could say nothing. So Diana with her wiles of Witchcraft so charmed him that he yielded to her love. This was the first fascination; she hummed the song, which was as the buzzing of bees, and the spinning of the wheel; the spinning wheel spinning life. 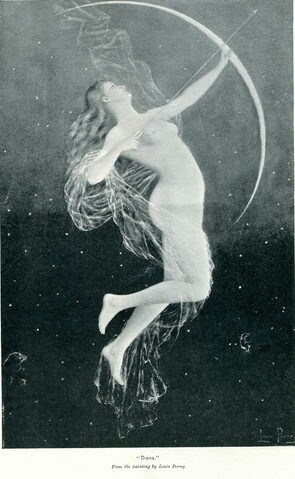 She spun then the lives of Men, and all things were spun from the wheel of Diana. And it was Dianus who turned the Wheel.